What's the connection between a 16th century Polish astronomer and a 19th century British naturalist? Nicolaus Copernicus and Charles Darwin may have lived three centuries apart but their thinking changed scientific perspectives. Thanks to Copernicus, we know the sun and not the earth is at the centre of the Universe, whilst Darwin's theory of evolution challenged the orthodox view that the species were created the same time as earth and in their current form. 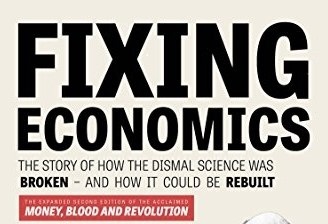 So what about the science of economics? Is it also due for a major re-think? Yes, according to George in his new book 'Fixing Economics' where he argues that modern economics needs to embrace a new way of looking at and understanding the world if financial crises are to be prevented in the future. George Cooper joined Juliette Foster at Share Radio to discuss the book and his ideas.